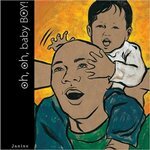 Oh, Oh, Baby Boy follows a newborn baby as he grows up, laughs, plays, causes mischief, and makes friends. His father's involvement is woven throughout the story, and depicted in nontraditional ways. The baby's father cuddles, bathes, and cooks with his son, and re-enters the story when the baby boy eventually becomes a father himself, bringing the journey full circle. Macbeth, Janine, "Oh, Oh Baby Boy!" (2013). DIVerse Families. 739.